“Ever notice how a city’s interesting quirks, cultural mix and historical perspective give it an aura, a vibe, an identity that sets it apart? Milwaukee is a relaxed sophistication. We’re a city where historic “cream city brick” buildings complement sweeping modern architecture and where a vibrant downtown combines with quaint neighborhoods and a green network of parks and bike trails. Perhaps surprising to people outside the metro region, Milwaukee’s theatre scene is one of the strongest, most vibrant of any city in the nation. Boasting two theatre districts, the city’s theatre offerings are varied and exciting. In the heart of downtown, the Milwaukee Repertory Theatre is nationally recognized as one of the top regional theaters in the country. Housed in a cleverly converted power plant in Milwaukee’s theater district, the Rep’s three theaters include a large mainstage, an intimate black box venue and the Stackner cabaret. Milwaukee’s “SoHo” district-the historic Third Ward-is home to the Broadway Theatre complex, featuring a jewel box replica of an Italian Renaissance theater and a studio theater. Resident companies include Milwaukee Chamber Theatre, Skylight Music Theater and Renaissance Theaterworks. Cutting edge Next Act Theatre just celebrated the opening of its new venue in a nearly converted warehouse. These companies and a plethora of young theatre groups keep critics busy year round. While you’re here, don’t miss the Milwaukee Public market, art galleries, shopping and restaurants of the Historic Third Ward. 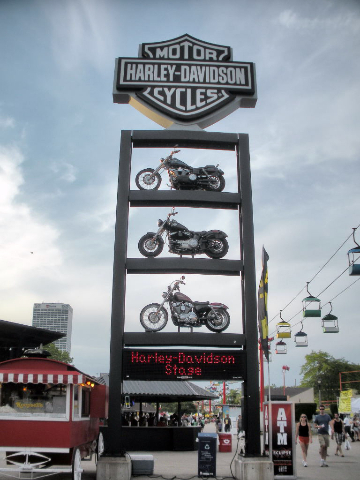 Visitors can be inspired by the spectacular architecture of the lakefront Milwaukee Art Museum with its majestic kinetic “wings” and experience the heart-thumping thrill of the open road at the spectacular one-of-a-kind Harley-Davidson Museum. We started our tour of Milwaukee by visiting the Broadway Theater Center (Skylight Theater) where several representatives shared their theatrical histories. Skylight Theater offers Broadway Classics as well as new works by producing innovative, eclectic and a thoroughly delightful combination of shows. Nearby, The New Act Theater has a unique brand of challenging, engaging theatrical adventures. We had a brief stop at historic Pabst Theater. 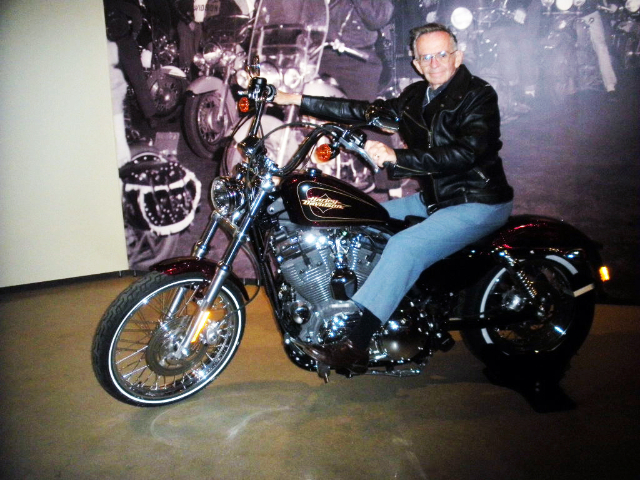 The Harley-Davidson Museum was one of the highlights of the tour. There was a special exhibit: “Worn to be Wild” (the black leather jacket). I learned how black leather became the fabric of American Culture. As one of pop cultures most enduring symbols, the black leather motorcycle jacket is the uniform of cool. Everyone from rock stars and leading men to rebel outsiders and fashion insiders have cloaked themselves in toughness and danger by donning a biker jacket. “Worn to be Wild” The Black Leather Jacket” traces the functional and design history of the biker jacket along with the evolution of the garment from clothing to cultural icon. Every jacket told a story. Gerry and I couldn’t resist the opportunity to dress-up in a black leather biker jacket and pose for a picture on a Harley-Davidson motorcycle in the Experience Gallery. 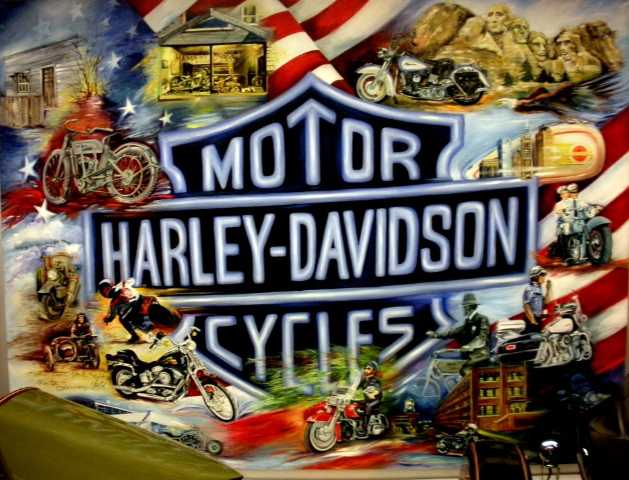 Harley-Davidson is known to bring heart-thumping adventure, life changing freedom and a bit of rebellion into the lives of people around the world. At the museum you will experience interactive, life-changing exhibits presented with an unparalled collection of legendary stories of our nation’s last century. 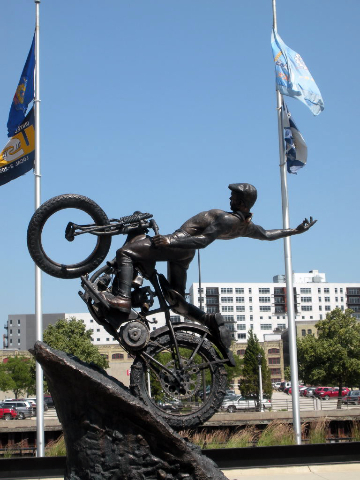 Here I learned about Harley-Davidson’s humble beginnings in Milwaukee during the Industrial Revolution; how an internal combustion engine works; Harley-Davidson’s contribution to America’s efforts in two world wars and how motorcycles have influenced pop culture. 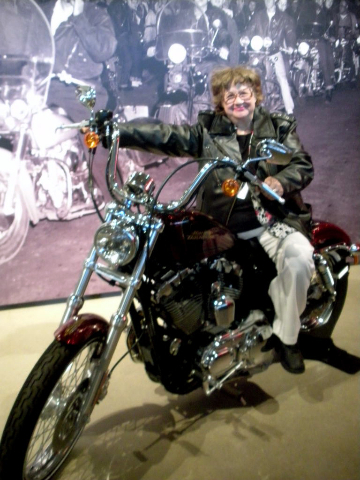 The Harley-Davidson Museum is more than a nostalgia trip for motorcycle enthusiasts, the Museum offers a glimpse of American history and culture you’ve never seen it before. Another special attraction was Milwaukee Art Museum, Milwaukee’s premier destination for art and culture located on shore of Lake Michigan. It is a marvel both inside and out. More than 20,000 works of art are exhibited from antiquity to the present in the 40 galleries. The Museum holds some of the nation’s best art work including one of the largest collections of Georgia O’Keeffe which is one of my all-time favorite artists. The special exhibit was “Posters of Paris” by Toulouse Lautrec and his contemporaries. These posters immediately transport you to nineteenth-century Paris, with larger-than-life, brightly hued artistic posters. There is always something to discover inside after you get your introduction outside with artistic majestic, kinetic “wings” flapping in the wind! I got my casino-fix by visiting Potawatomi Bingo Casino to dine at one of their five restaurants and observe the gambling and Bingo. Next day provided another special highlight of my Milwaukee visit: Ten Chimneys. This attraction is more than a great museum. Ten Chimneys is an experience. One that inspires you to design the life you want to live. A muse. A dream. Ten Chimneys delights and rejuvenates-and stays with you long after you leave. 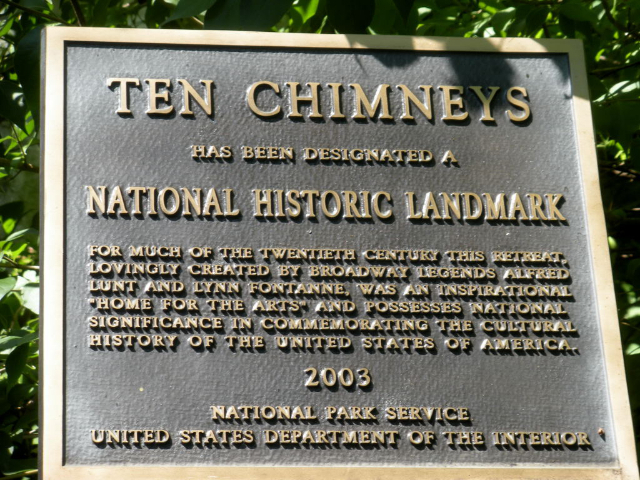 Ten Chimneys is the estate lovingly created by Broadway legends Alfred Lunt and Lynn Fontanne. With no ropes and nothing under glass, Ten Chimneys treats guests to a VIP guided tour of a National Historic Landmark with beguiling original furnishings and overflowing with the romance of the 1930s and ‘40s. Guests are placed in small comfortable groups and are led through the estate by a docent. 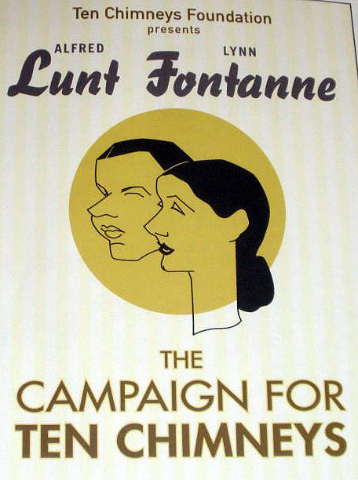 They shared stories that interpret not only the objects and décor of the estate, but also the lives and values of its remarkable creators, Alfred Lunt and Lynn Fontanne. The tour includes the three-story Main House, rustic Studio, enchanting cottage, restored garden and the exterior of the Poolhouse, Greenhouse and Creamery. When we had some time on our own, there was a Polish Fest within walking distance of our hotel which proved to be quite a delightful experience culturally and tasting Polish delights.